After visiting TATE Modern and marveling at the incredibly simple and mundane pieces of "art" we figured that everything can be art if you put it in a museum. That's why we created a tool that generates a display caption for it, so you can be up and running in a museum in no time. It takes a picture uploaded by the user and generates a unique description for it, as if it were an elaborate piece of art, filled with deep meaning. Unfortunately, the domain was already taken, but we kept the name because we like it. We scraped the TATE website to get a couple thousand descriptions of modern artworks, and their tags. 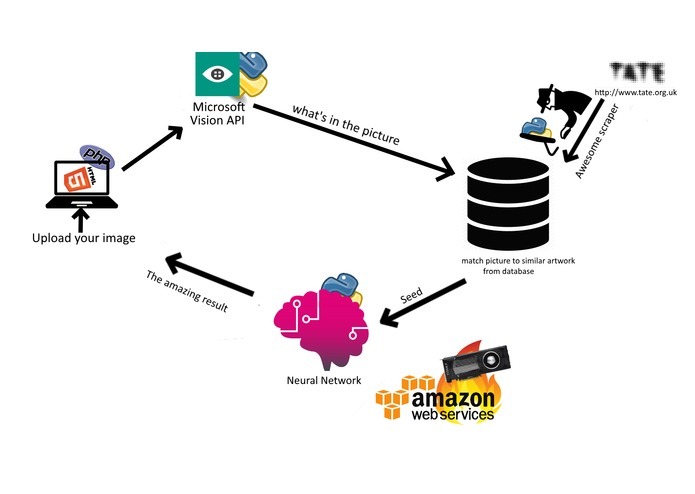 The frontend then takes the image uploaded by the user, runs it through the Microsoft vision API to get a list of things in the picture. This list is then matched to the closest entry in the database to use it as a seed for a Recurrent Neural Network whitch was trained using an AWS GPU instance. The description this generates is then presented to the user, who is now some sticky tape away from having his/her art in a museum. writing the scraped data to a file periodically, in case the scraper gets stuck after an hour of running so we don't lose everything when Ctrl+C-ing it.